JERUSALEM — A Jerusalem museum is breathing life into the ancient city with a new virtual reality tour that allows visitors to experience how archaeologists believe Jerusalem looked 2,000 years ago. The Tower of David Museum, which is housed in the Old City's ancient stronghold, plans to launch the high-tech guided tour this month ahead of the Jewish holiday of Sukkot. 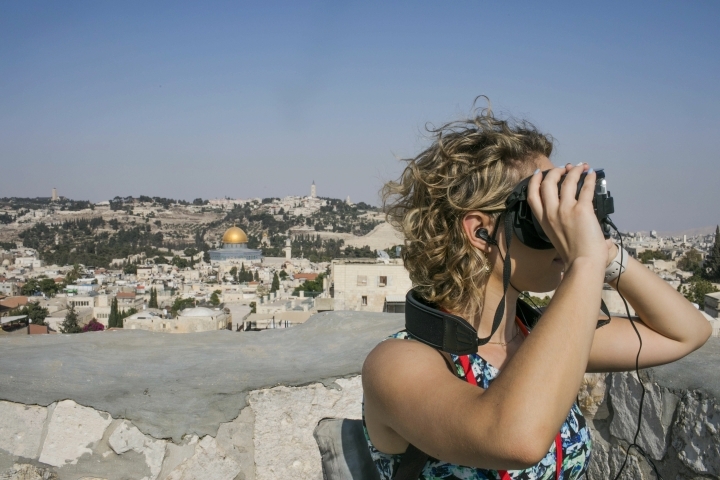 The virtual reality guide, "Step into History," offers visitors a chance to "walk in the streets of Jerusalem and enjoy the present and take a look back to the past," said Tower of David Museum director Eilat Lieber. Working with archaeologists from the Israel Antiquities Authority, Lithodomos VR created 360-degree simulations of how Jerusalem's citadel, palaces, streets and ancient Jewish temple are believed to have appeared during its heyday under King Herod in the first century B.C. and during the life of Jesus. Herod, a Roman vassal who ruled Judaea from 37-4 B.C., invested heavily in large construction projects across his realm, including a major expansion of the Jewish Temple in Jerusalem and the fortress and palace where the Tower of David stands today. His monuments, including the mountaintop fortress at Masada and the port city of Caesarea, are among the most visited sites in Israel. "Especially with Jerusalem, I think the biggest challenge was getting it right," said Simon Young, founder of Lithodomos VR, an Australian startup. "There's a lot of different opinions about how Jerusalem looked in the ancient world... Of course, we want to do justice to Jerusalem and to make it as accurate as possible." Lithodomos VR's team of archaeologists and artists has produced similar projects in London, Rome, Athens and other cities. The Tower of David Museum also houses an innovation lab in a chamber at the top of a Herodian-era keep that once served as the chambers of Jerusalem's Ottoman governor. The lab, launched in October 2017, hosts startups such as Lithodomos VR that are developing technologies to enhance visitor experience, with a particular emphasis on virtual and enhanced reality. The site also holds an elaborate light show that projects moving images in intricate detail on the ancient walls of the Old City. Accompanied by a guide, visitors will be able explore nine different vantage points in the city, starting at the citadel — an Ottoman-era fortress built atop remnants of several earlier bastions — then meandering through the Old City's Jewish Quarter down toward the remains of the Second Jewish Temple. In order to keep from crashing into modern Jerusalem, visitors carry the goggles between sites, then put them on once they are stationary. At each point, a narrator explains the historical significance of the structures they can see in the goggles: the columned marketplace of the Cardo, the heart of the ancient city; the soaring towers of Herod's citadel; the opulent pools of his pleasure palace; and the temple. The VR tour around the Old City takes approximately two hours, the museum said. The tour is confined to the Old City's Jewish Quarter. The Old City lies in east Jerusalem — an area captured by Israel in the 1967 Mideast war and claimed by the Palestinians as their future capital. Israel rejects any division of the Old City — home to Jerusalem's most sensitive Jewish, Muslim and Christian holy sites. Young says the Lithodomos VR team would be interested in adding additional historical layers to the virtual reality guide that would allow people to explore Jerusalem during other periods, such as the Crusades. Judy Magnusson, an Australian tourist who previewed the tour on Monday ahead of its launch, said the virtual reality-enhanced experience "brings history to life" and makes the stories about the city "more real."